Gentell Hydrogel Ag Silver Antimicrobial Wound Dressing combines the unique properties of silver sulfadiazine and aloe vera. Data demonstrate efficacy of silver sulfadiazine on reducing both gram positive and gram negative bacteria, and inhibiting growth of resistant bacteria without harming healthy tissue. 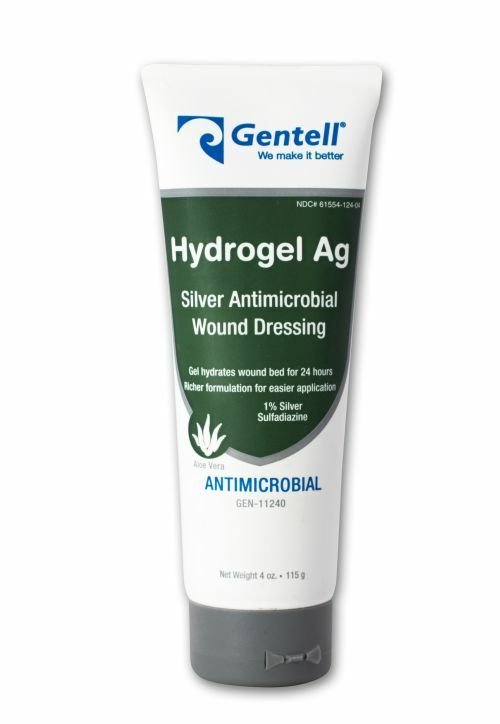 Gentell Hydrogel Ag Silver Antimicrobial Wound Dressing can be used on chronic wounds, stage 1-4 pressure ulcers, first- and second-degree burns, venous ulcers and dry to minimally exudative wounds. Contraindicated for use on patients with sensitivity to sulfonamides, previously reported sensitivity to silver sulfadiazine and pregnancy. Contact with the eyes causes irritation, redness or stinging. Contact with skin should not be irritating when used as intended. Inhalation of high concentrations of vapor may cause irritation, coughing or chest discomfort. An accidental ingestion of this product may cause dizziness, faintness, decreased awareness or responsiveness, nausea or vomiting. Adverse effects are rare, but may include induction of hemolysis in patients with glucose-6-phosphate dehydrogenase deficiency. There can be a transient leukopenia in some patients. Occasional cases of fungal infection of eschar (scar tissue associated with burns) have been reported. Flush the wound with Gentell Wound Cleanser and gently dry the skin surrounding the wound site. Use an appropriate clean applicator or gauze to apply a 1/8" layer of Gentell Hydrogel Ag to the entire surface of the wound. Cover wound with an appropriate secondary dressing. Change dressing daily or as ordered by a physician. Gentell manufactures a complete line of advanced wound care and skin care products. Gentell serves the health care community worldwide by providing high quality products, advanced technology, and comprehensive wound management programs.